Tap the power of color combinations. $9.99 - Find out more below! Sometimes one color isn’t enough and you need an engaging color combination that packs the most powerful symbolism. You’ll find 50 harmonious color schemes in this publication. These reliable color combinations convey meanings matched to specific symbolic meanings such as dynamic, expensive, high quality, intelligent, joyous, dependable, spiritual, festive, healthy, etc. Can you guess the symbolism? Each color combination presents two sets of colors. Use the colors in the large background squares for the main areas of your design. Use the colors in the narrow horizontal stripes for smaller areas or accents. Detail below. 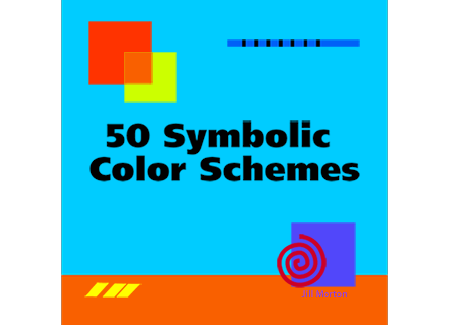 Each of the 50 color schemes is well-illustrated and easy to duplicate using the RGB and HEX codes. Color associations are based on traditional interpretations and well-indexed for quick symbolic comparison. Descriptions of color harmony, computer colors, color models, and design applications are included. “After reading ’50 Symbolic Color Schemes’ my chances of making good color choices for our website have now improved 1000%.” … Matt W.